Your vehicle’s exhaust system is responsible for collecting and directing harmful emissions away from the vehicle, which reduces the amount of pollutants released into the environment, and minimizes engine exhaust noise and force. The exhaust system is made up of many different parts including pipes, tubing, catalytic convert, muffler, tailpipe, downpipe, frontpipe, and the exhaust manifold. Four County Import Service’s exhaust systems specialist are experienced in exhaust system maintenance and repair in all makes and models of vehicles. Exhaust system maintenance and repairs are one of the most important repairs in your vehicle, since problems with your vehicle’s exhaust system can affect both your vehicle’s performance and your ability to drive. If your vehicle is making any rattling or loud noses, sharp odors, or is showing any signs of cracks or rust in its exhaust system, or these reasons, give the experts at Four County Import Service a call or stop into our state-of-the-art auto repair facility in Mt. Airy, MD. 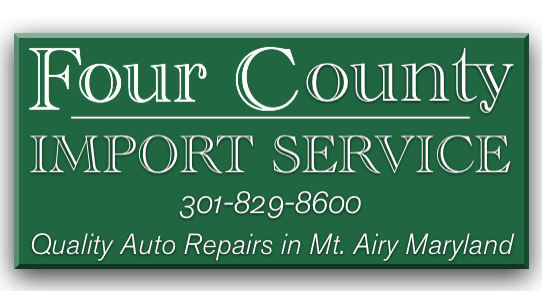 Four County Import Center Mount Airy, MD and surrounding areas in Montgomery County, Howard Count, Frederick County, and Carroll County with quality exhaust system maintenance and repair for all makes and models of vehicles. Give us a call at 301-829-8600 or stop in today!